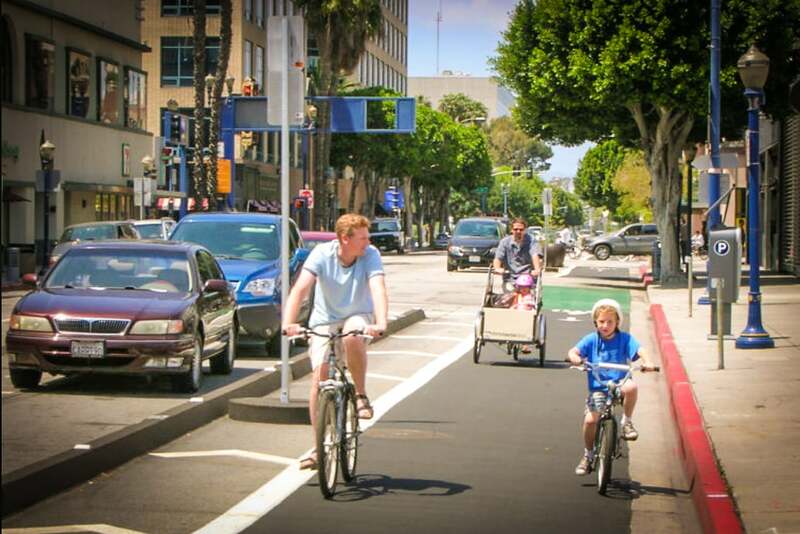 The protected bike lane on Broadway in Downtown Long Beach. For any bicyclist that rides east or west through the southern stretch of Long Beach, Alamitos Avenue presents a frustrating line of division: Right before you hit the protected bike lane on Third Street at Alamitos heading west, you must switch from the north side of Third, cross the intersection with eastbound traffic and northbound traffic from Alamitos traffic turning onto Third, and cross over three lanes to (hopefully) make it into the protected bike lane on the south side of Third. That long-standing uncomfortable transition—this intersection has existed this way since the installation of the popular bike lanes back in April of 2011—will soon be gone. City officials have opted to move the portion of the bike lane between Magnolia Street and Alamitos Avenue to the other side of Third, and they’re doing the same thing on Broadway. In other words, those traveling westbound on Third will stay on the right-hand side of the street as well as those traveling eastbound on Broadway. The project’s focus on seamlessness works two ways: Bicyclists now avoid having to dangerously cross in front of cars west of Alamitos and, on Broadway, the shift in the placement coincides with the now-underway Broadway re-visioning construction taking place between Alamitos and Redondo avenues. With Broadway finally set to have protected bike lanes throughout the Gayborhood, bicyclists can more smoothly transition: If heading east, they will no longer have to cross traffic and Alamitos unsafely to access Appleton or Third. While the plans are official set, a date for construction to begin has not been formally decided.